Hillary’s campaign for President is a vacuous fraud. She staked her campaign on Obama’s satanic legacy, foremost by her outright rejection of Glass-Steagall, especially after she was publicly challenged by LaRouche activist Daniel Burke while speaking on her economic policy at The New School in New York City in July of 2015, where she was too cowardly to even address the issue. Besides her bedroom dalliance with Wall St., she has jumped into the sack with Obama’s favorite mum, the British Queen, calling for war with Russia as the main selling point for what amounts to a pointless and surreal campaign. Things have become so outlandish, that even her top advisers cannot but blame the Soviet-era K.G.B. (sic) for her collapsing numbers, loss of trust, and low turnout. Perhaps it has to do more with the fact that most Americans abhor the current Wall St. system, are horrified by the rhetoric against Russia, are dismayed by the failures of the war against terrorism, terrified of Obama’s blood thirsty drone killings, see no hope of economic recovery via green jobs and climate scaremongering, and are facing cultural breakdown due to the drug epidemic and collapse of healthcare, jobs, and basic productivity. In other words, acting on behalf of the British imperial interests undeniably disqualifies her for the Presidency in the minds of a great majority of the American people! Let’s make something clear. The Glass-Steagall law and U.S. policy towards Russia and China are not just two issues among many—they are the existential questions determining the future of our nation and our civilization. It is not just the question of war and peace, but of the survival of civilization. Any President who fails on these issues shall be condemned early and often by the American people—if we are still here to condemn them. Consider that the entire trans-Atlantic financial system has been in a perpetual melt-down since 2008, as if preserved in formaldehyde by Obama’s bailouts and central bank stock buybacks, all to prop up the venereal stock market indices, while the physical economy—the one people actually depend upon for physical survival—becomes more and more incapable of supporting a healthy and productive human population—which is the actual baseline economic metric, in case you forgot! Glass-Steagall is the initial first step in a full national recovery (see page 2 for the full comprehensive program). Not only will Glass-Steagall stop the economic bloodletting and provide immediate relief to the great majority of the American people, it will be another “shot heard round the world!” This resurgence of a true United States, one of Hamilton and John Quincy Adams, Lincoln and Franklin Roosevelt, will facilitate an entirely new global economic and strategic system, providing the long-term basis for a reconstruction of our national economy. To Donald Trump’s credit, he has made a commitment to Glass-Steagall, and has acknowledged Hillary Clinton’s desperate attempt to cast Vladimir Putin and Russia as the enemy image, and thereby risking nuclear war. Much as both Bush 41 and 43 pushed British geopolitical schemes of perpetual war in the Middle East, including the attacks on 9-11, so now Hillary Clinton, not even yet President, resorts to these same dangerous measures, blaming all her problems on Russia and ultimately pushing a policy of nuclear confrontation! From any perspective other than the psychotic Obama-Clinton legacy, Russia and China are the greatest potential allies for the U.S. From economic development (see China’s New Silk Road and the LaRouchePAC World Landbridge), the war on terror (see Russia’s actions in Syria as well as China’s New Silk Road for development in southwest Asia), the international drug trade (e.g. eradicating the opium fields in Afghanistan and building up south Asia via China’s New Silk Road), ending global poverty (see development projects in places like Libya, Ethiopia, and even eastern Europe via China’s New Silk Road), and even reinvigorating our national space program (we currently use Russian rockets for manned-flight, and China has the most advanced space program on the planet). These three major nations, the U.S., Russia, and China—each of which played a critical role in the victory over fascism in World War II—remain the most important nations in the world to eradicate the scourge of what remains of a dying British Empire today, and the establishment of a new platform for the creative advancement of the human species more broadly. There is little doubt that, if elected, under her current direction Hillary will have a failed Presidency much like Obama—if not early indictment, impeachment, and a humiliating resignation. She has no support among even the base of the Democratic Party, especially on the question of Glass-Steagall, and her war mongering towards Russia, Syria, et al. Hillary’s great compromise with Obama was her very political downfall. She lied, and continues to lie, just so she can be President. That is not a worthwhile campaign. Her perpetual lies have protected Obama’s murderous program, but, Hillary’s greatest fraud is her lack of devotion to the American people, and to the truth. She is a failed person, a functioning British agent, and she should not be allowed near the Presidency. The American people must demand a functioning Presidency based on the full recovery program of LaRouche’s Four New Laws, and the establishment of working ties with Russia, China, as well as all other major nations. The times are dire and existential, but there is also great potential in the world. Our action is urgent regardless of the outcome of this election. 1. The immediate re-enactment of the Glass-Steagall law instituted by U.S. President Franklin D. Roosevelt, without modification, as to principle of action. 2. A return to a system of top-down, and thoroughly defined, National Banking. The precedents for this shall be taken from the banking-and-credit system established by Alexander Hamilton, as well as Abraham Lincoln’s action of creating a national currency (“Greenbacks”), under Presidential authority. 3. The deployment of a new Federal Credit system to generate high-productivity trends in improvements of employment, with the accompanying intention to increase the physical-economic productivity, and the standard of living of the persons and households of the United States. An increase in productive employment, as accomplished under Franklin Roosevelt, must reflect an increase in real productivity, coherent with an increase in energy-flux density in the nation’s economic practice. 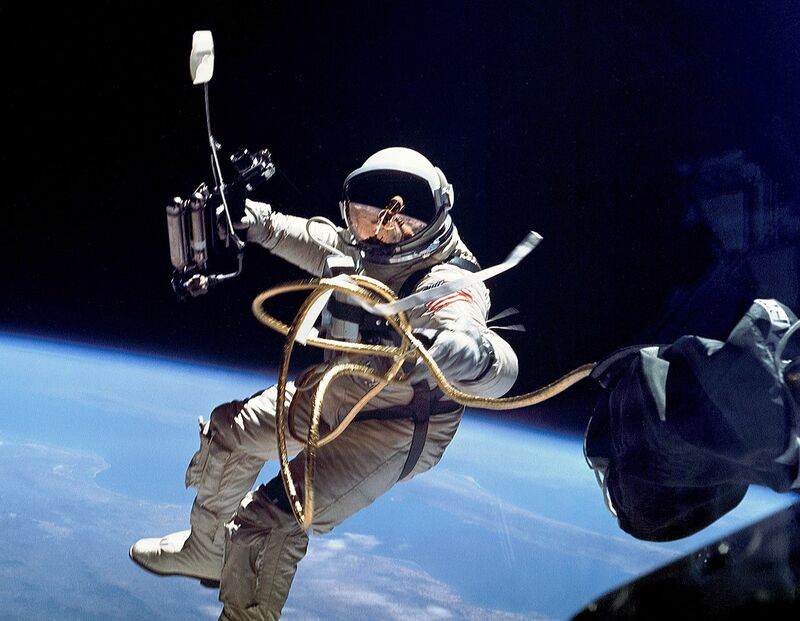 Astronaut Ed White performs the first space walk, June 3, 1965. The standards set forth by Alexander Hamilton in his four reports to Congress were the principles on which our nation was formed. Hamilton described the essential principle of economy as a system of productivity, where the primary measure of value was not based on capital, but the creative powers of mind, which increase the productive powers of labor. Our nation’s Declaration of Independence and Preamble to the Constitution demanded Hamilton’s credit system. The idea of the inalienable rights of man is premised on the freedom of human beings to create and discover new principles, which improve mankind’s existence in and over the universe. The Pursuit of Happiness is not defined by how much money you possess or what a nation holds in its treasury. It is the ability of each person to contribute to the productivity of the nation and the posterity of that nation. This defines the necessity for credit. Wealth is not created directly by the printing of money. Wealth is measured in the productivity of the economy. The standards set out by Hamilton in his four reports are universal principles that determine the measures so urgently needed to bring about a new paradigm throughout the planet today. These measures understood and developed uniquely by LaRouche are now being adopted by leading nations throughout the world and must be the standards to which the United States immediately returns. A nation’s commitment to its future, and increasing the scientific and creative output of its society, is a fundamental principle understood by those leaders who have enacted the standard of credit defined by Alexander Hamiltonian. The development of space, and all resources, is a key driver for economic progress throughout the planet. It is not a matter of simply enacting low cost programs placing human lives and the destiny of the nation in the hands of some profiteers. Space exploration is essential for freeing mankind from the confines of one small planet, ending any limitations to mankind’s growth and potential. Mankind must be freed from the grips of tyranny, of poverty and of the threat of thermonuclear war, which threatens our very human existence—a result of the failed policies of speculation and bailouts that has continued to dominate the United States and trans-Atlantic system. We must seek to free our Nation’s people from a culture of degeneracy, drug abuse, death and despair—what has been the policy of Presidencies of George W. Bush and especially Barack Obama, and now for nearly two decades. We need a renewed mission to scientific progress in this nation. This is the standard of growth on which nations following the policies of Hamilton and LaRouche are now coming together—part of a commitment for cooperation on economic progress—as expressed by the developments of Russia and China, as with China’s offer of a win-win solution for the benefit of every nation as prescribed in its Belt and Road initiative, which includes the development of space such as the far side of the moon. Shortly following this address member states of the BRICS nations agreed to set up joint systems of space satellites for earth remote sensing, as reported by the head of the Russian space corporation Roscosmos. This is a decisive move toward cooperation in space, and which leaves the U.S. isolated and mundane. We must restore our commitment once again to a national mission and a true science driver program, just as LaRouche has prescribed in his four laws. The United States must take up the offer of international cooperation. We must define a new standard of credit for development throughout the planet, just as Hamilton established, which supersedes mere monetary value and establishes a system that truly invests in the future of its people and the future of its nation. This entry was posted in LPAC, New Presidency and tagged BRICS alliance, British empire assets, Glass Steagall, Hamiltonian Credit System, Hillary Clinton, Kesha Rogers, LaRouche's Four Laws, Michael Steger, National banking, New Silk Road, Obama's treason, science driver, scientific discovery, space exploration, win-win. Bookmark the permalink.